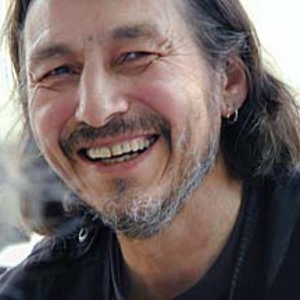 Trudell is the son of a Santee Sioux father and a Mexican mother. He grew up around the Santee reservation near Omaha. He joined the Navy in 1963 and served in the Vietnam war. He joined the American Indian Movement and in 1979 his mother-in-law, pregnant wife and three children were killed in a suspicious fire, a tragedy that led him to poetry. His first album, originally made with brilliant Kiowa guitarist Jesse Ed Davis and originally available only on cassette tape, was A.K.A Graffiti Man. More recent endeavors include Blue Indians and Bone Days.